MISSION — The senate candidate climbed onto the back of a John Deere Gator utility vehicle, crossed his legs and soon saw the start of federal construction he had no idea existed. Federal officials, in a move unknown to O’Rourke and most other elected officials, began clearing out trees and shrubs by the border levee in July here at the National Butterfly Center, even without informing the center’s director, Marianna Treviño Wright. Those were the embryonic stages toward building President Trump’s border wall. “That’s crazy,” said U.S. Rep. Beto O’Rourke, D-El Paso, on Saturday. A big part of O’Rourke’s bid to unseat Republican U.S. Sen. Ted Cruz is listening to people in every corner of Texas, whether they agree with him, as was the case with most he met in the Valley, or not, such as when he visits places like King County in West Texas. U.S. Rep. Beto O'Rourke, D-El Paso, walks into the Mission Chamber of Commerce while in the Valley campaigning for the U.S. Senate on Saturday Jan. 6,2018, in Mission. 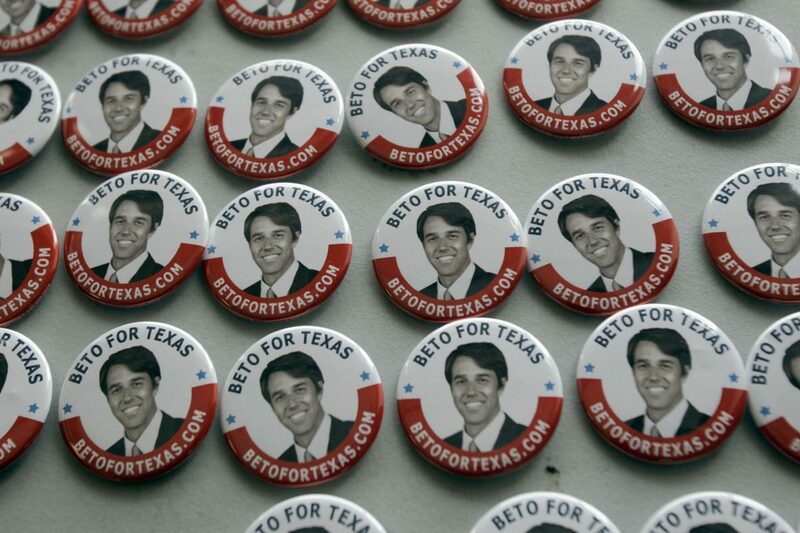 Beto O'Rourke pins are seen during his campaign stop at the Mission Chamber of Commerce Saturday, Jan. 6, 2018, in Mission. Despite being from the border, the desert border in El Paso is much different than terrain in the Valley. O’Rourke had toured Santa Ana Wildlife Refuge on a prior visit, but this was new. 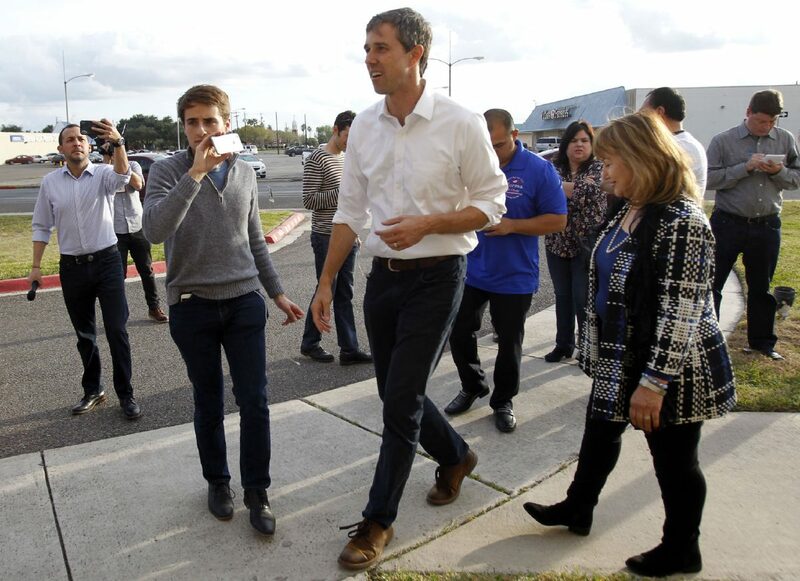 O’Rourke has visited the Rio Grande Valley multiple times in the last year campaigning. This weekend was his most ambitious yet, with three town hall meetings Saturday, beginning in San Benito at El Sabor de Mi Tierra. His visit will conclude with a Sunday morning jog with whoever shows up at Firemen’s Park in McAllen. “You are part of what already makes America so great, right now,” O’Rourke said, a subtle jab at Trump’s “Make America Great Again” slogan. Despite that Trump reference, O’Rourke didn’t spend much time snapping at Trump or Cruz throughout the day, though he made sure to highlight Cruz’s unpopularity in Texas multiple times. “You can look at the numbers,” O’Rourke said. “Out-raising Ted Cruz, polling even with him when we entered this race.” He also cited the recent Alabama senate win by Democrat Doug Jones over Republican Roy Moore, who O’Rourke said was more popular in that state than Cruz is in Texas. “Ted Cruz is liked less in Texas than Roy Moore, who lost that senate race, is liked in Alabama,” the candidate quipped. After a round of applause, O’Rourke returned to his mostly positive tone throughout the day. He spoke in terms such as “together” and “us” often, which supporters seemed to respond to. Carlos Vela, a school teacher in Los Fresnos, said he likes that O’Rourke isn’t taking Political Action Committee money. O’Rourke’s call to end the federal prohibition on marijuana also resonated with the San Benito crowd. The Valley typically votes heavily Democratic, so it appeared that there were only supporters for O’Rourke throughout the day, unlike when Cruz’s visits, which are often accompanied by protesters. O’Rourke’s second town hall was at the Mayor Eugene A. Braught Memorial Theater in Weslaco, in front of a full auditorium. After O’Rourke spoke, several currently enrolled Ivy League students from the Valley asked about the education system here. He explained how he started a software business, and eventually was able to offer high-skilled, high-paying jobs. After posing for post-town hall photos, O’Rourke made a stop at the butterfly center where he was briefed on the problems Treviño Wright faces with the current proposed border wall cutting through their property. Scott Nicol, an executive board member of the Lower Rio Grande Valley Sierra Club and co-chair of the Sierra Club Borderlands Campaign, was also on hand. O’Rourke recognized him earlier from previous meetings. Nicol held up a “No Border Wall” sign, which O’Rourke took a photo with. The final stop of the day was a town hall at the Mission Chamber of Commerce, which was perhaps the most enthusiastic of the three. Many audience members brought up the border wall, with O’Rourke mostly agreeing with their sentiments. 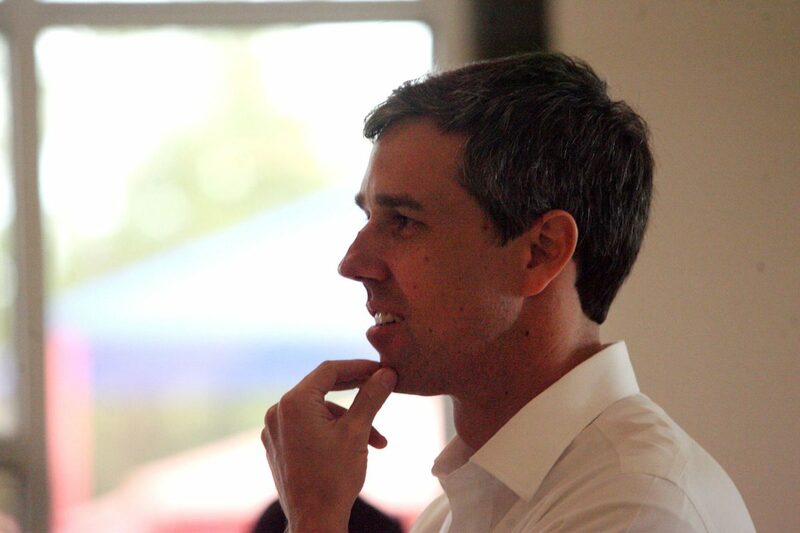 Throughout the day, veterans issues came up, and O’Rourke told a recent story of his bipartisan work in Congress, which he likely hopes is a representation of what his campaign is all about and what he could accomplish in the Senate. He wrote and introduced a bill to give veterans expanded access to mental health care, but it failed to pass. But he later found a Republican colleague from Colorado who had a similar idea. The two compromised and came up with a bipartisan bill, where it passed the committee stage. “We had our day on the floor of the House of Representatives, and it passed 435-0,” he said. Before he took questions and asked the audience to hold him to account, he asked the crowd to help with the thing that he believes is necessary for him to beat Cruz.